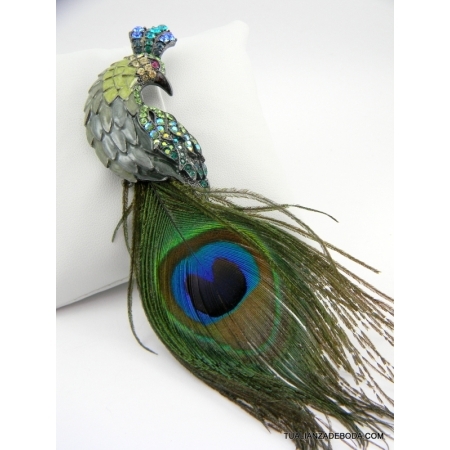 BROCHE MARCA SILVERWORLD DE METAL EN FORMA DE PAVO REAL CON UN COLORIDO EN TONOS VERDES Y CIRCONITAS DE COLOR AZUL, VERDE Y ROSA. EL BROCHE TIENE TAMBIÉN UNA PLUMA DE PAVO REAL COMO SI FUERA LA COLA DEL MISMO. ES UN BROCHE QUE SE PUEDE USAR TAMBIÉN COMO COLGANTE. EL BROCHE MIDE DE LARGO, INCLUIDO LA PLUMA, UNOS 16 CM.